They are now in my greedy, sweaty little hands and I couldn’t be more pleased! 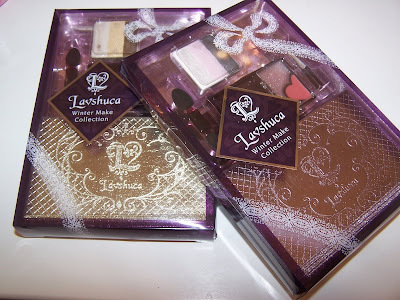 The palettes came in the cutest little gift box and if you happen to have a Japanese cosmetic lover in your life these would be the perfect gift! They come packaged in separate parts. 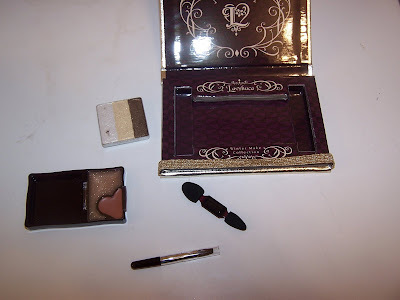 One part is the empty compact and the second part is your lipgloss, eyeshadow, and applicators. I assume that they package the parts separately for beautiful display reasons, it also keeps things nice and tidy during shipping, and finally it’s just good, old plain fun to put it all together into the compact yourself! The compact isn’t a hard shell it’s a durable cardboard which may sound worrying because you might be thinking this means it’s on the cheap and shoddy side. Fear not! The cardboard is quite sturdy and not cheap in the least. It’s covered in either a pink or gold foiling depending which color you end up purchasing with the lovely Lavshuca emblem on top. 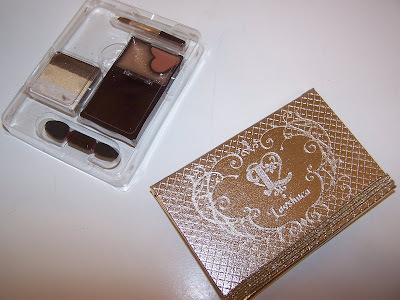 Inside there are two separate spots for the sponge eyeshadow applicator and lipbrush on either side with the eyeshadow and gloss smack in the middle. The Lavshuca emblem again graces the inside top of the palette. 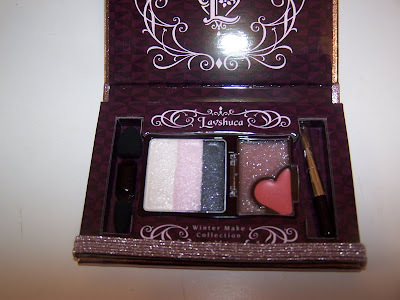 I haven’t yet tried any of the colors but from what I can see the strip of eyeshadows are quite shimmery and gorgeous and I’m hoping it isn’t a spray of glitter but a sparkle straight to the core. You’ll also receive a sparkling lipgloss and a matte lipcream. The size of the shadow strip is a tiny bit disappointing because it’s really NOT a whole lot of product but if you generally collect tons of palettes and shadows you won’t mind too much because chances are you won’t go through this very quickly! However, if you don’t own a ton of different shadows and you’ll be using this daily chances are you’ll get through it very quickly as it’s not a whole lot of product! 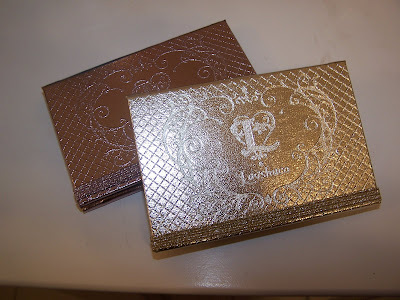 I have to say that at the moment I find them both very pretty but I do favor the 02 palette better than the 01. 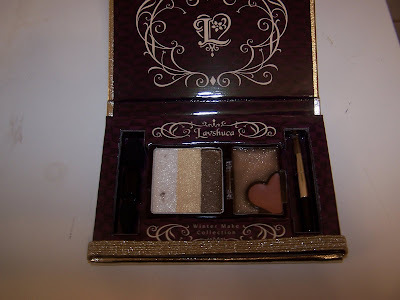 02 eyeshadows consist of a white shimmering gold color, a shimmering yellow gold, and a shimmering brown with gold specks. 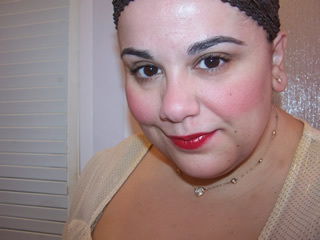 The gloss is a sparkling golden brown color while the lipcream is a orange brown. Layering the gloss and lipcream will surely make a striking combo! 01 is just as pretty and consists of a shimmering white with, it appears, to me, pink, a shimmering pink shade, and a darker purple. The gloss is a sparkling pinkish purple affair while the lipcream is rosebud pink. Overall, I’d say they are most definately worth a pick up! 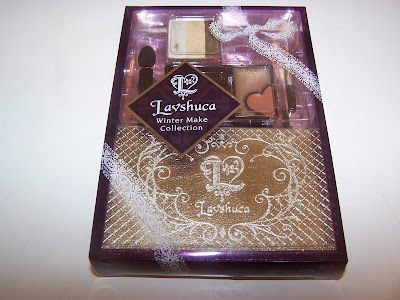 The Lavshuca Winter Make Palettes are Muse Approved for purchase! 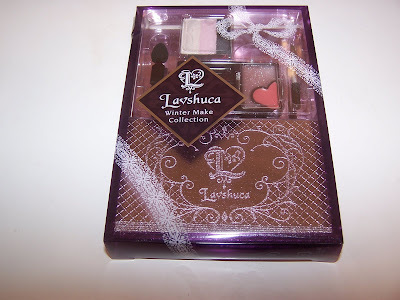 Do visit PJ to see A Touch of Blusher’s impression on these palettes you can also visit with RF at Make Up & Stuff and see some more about the Lavshuca’s Holiday Palettes! I like the 02 better than the 01 too! I only got the 02. By the way, I liked your response to the horribly rude person who left such a mean comment! They are both lovely but 02 is super nice! Aw thanks. I’ve been receiving that sort of comment for a while so today I thought I’d go ahead and publish it and address the issue as it gets rather tiring seeing it pop up time and time again! I have no clue if it’s the same person or not! I’m only assuming it is but I’m a bit weary of rejecting it over and over and like she said it’s her opinion. I just don’t personally agree with the way she (or he) expresses her opinion! I only planned to get one so I chose the pink one, but I am sure the gold tones will suit me as well. i would say i do not love them.. simply because the shadows are all together. after a while it would get all mixed up. so not for me! its nice to look at though. been admiring it from the website, adambeauty, ichibankao, PJ’s blog, yours etc. hahaha. p.s. aussie’s lush does ship intl but with a very hefty price tag. and they do not have a lot of stuff that you show on your blog. I liked your first impression on the palettes. You might go back later and grab the gold 😉 you never know! I actually took them out after doing the pictures and I have them on display in the box as well 🙂 They look so cute I couldn’t resist! Oh 🙁 What about HK? Or japan? Is it cheaper to ship via air from either? Or try UK! I dunno how much to Singapore from England but it may be worth it! You can get these at http://www.adambeauty.com or wwww.ichibankao.com (ichibankao is in english). If you’re going to the Lavshuca site it’s only to show you what is available 🙂 You have to use an international outside source to purchase and in our we normally order from ichibankao, adambeauty, or if you’re daring and willing to navigate through endless chinese characters you can order from JpMon. Oh you got these goodies!!! Are they good? Do let me know once you used them! I’m tempted to get both too! I dunno yet. They are in the stage of too pretty too touch lol!